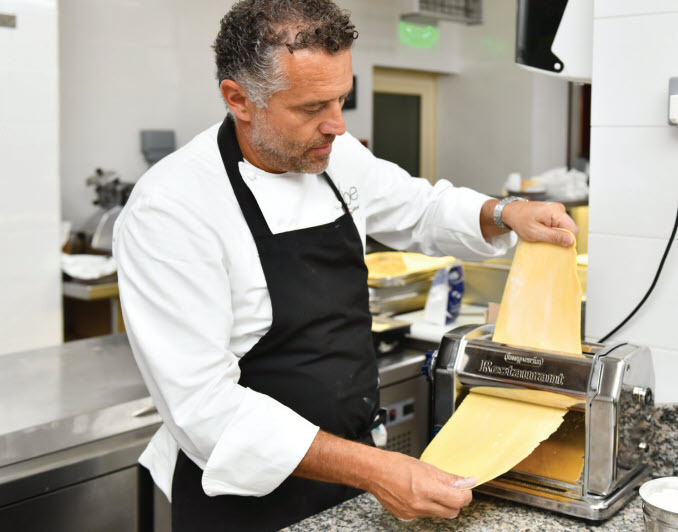 Italian celebrity Chef Giancarlo ‘Xbe’ Perbellini is back in the kitchen, doing what he loves best, preparing for this week’s grand opening of his signature restaurant in Bahrain. The Gulf Hotel Bahrain Convention Centre & Spa’s La Pergola has been rebranded as La Pergola by Perbellini following a stunning BD200,000 redesign and extensive refurbishment, as revealed in GulfWeekly. To ensure nothing goes amiss, Chef Xbe (pronounced Perbe) has been diligently working with his team of chefs putting the finishing touches to the menu and staging special pre-opening tasting sessions. Beautiful sea-blue walls with matching covered comfortable seats have been cleverly combined with lit golden panels that conjure a vision of bubbles rising from a sea bed. The theme in Chef Xbe’s heart was ‘from the earth to the sea’. One of the kingdom’s oldest Italian restaurants, which, to be honest, had felt a little staid and dated, has been transformed into a vibrant, airy, cool, comfortable and contemporary dining destination. The new design of La Pergola by Perbellini has been inspired by his outlet Al Capitan, a winning vibe he wanted to mirror here. As well as celebrating the cuisine, restaurant reviewers have also highlighted its ‘warm and welcoming ambience in the heart of Verona’. He says the aim was always to create a similar buzz in Bahrain with a feel that encapsulates the desert sands alongside the waves and beauty of the Arabian Gulf. As well as the look and ambience of the restaurant, he knows Italian food connoisseurs and regulars of the Gulf Hotel outlet will judge him on the quality of the fare on offer. Amongst the delights delivered during last weekend’s tasting sessions attended by VIPs, ambassadors, business executives and members of the media, was the Risotto alla Milanese, Olio di Finocchio e Arancia, a Milan interpretation of a classic northern Italian rice dish, cooked in a broth dish which results in a divine, thick and creamy concoction, as highlighted in last week’s Eating Out review. As predicted, the Filetto di Manzo Pire de Patate Affumicate, a divine pan-fried Angus beef fillet placed on a layer of smoked mashed potatoes, alongside olive pesto and slowly-cooked tomatoes, was a main course that also bowled over the guests. It’s been a busy time for Chef Xbe who also opened a new restaurant in Milan in April to much acclaim. And, of course, the two-Michelin starred culinary king is one of Italy’s most celebrated pastry chefs, a legend amongst his peers. Coming from a long line of pastry makers held in high regard since 1890, he is acclaimed for his desserts. “That’s still my passion,” he said, shortly after serving an exquisite Meringa, a fresh fruit Panna Cotta-style dessert with meringue.